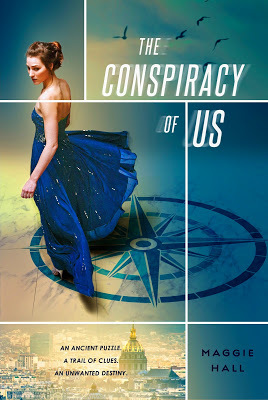 I’m so excited to interview Maggie Hall, author of The Conspiracy of Us trilogy, on the blog today. The Ends of the World, conclusion to the series, released this past summer. Hi, Maggie! Thank you so much for stopping by my blog today! Hi Jordan! Thanks for having me on your blog. For those who haven’t read Conspiracy of Us yet, what are five words you would use to describe it? Let’s talk characters. Avery’s world-saving crew consists of Jack, Stellan, Elodie, and Luc, who are all pretty different from one another. What are some traits that these characters have that you wish did? Great question! I love each of the characters for different reasons. Sometimes I wish I had Jack’s ability to do what he has to, regardless of how he feels about it—though that sometimes got him in trouble, too! Stellan’s really good at seeing the big picture and not letting things get to him when he’s doing something important, which I envy. I definitely wish I was as witty as Elodie. And I’ve always wished I had more of Luc’s ability to see the bright side in any situation! One of my favorite parts of The Conspiracy of Us trilogy is all the traveling! How many different countries have you visited and were there any book research-specific trips? Where would you love to travel to next? I’ve been so many places, but there are still tons I want to get to. I still haven’t been to South America, and there are tons of countries there I’d love to visit, like Argentina, Brazil, Uruguay, Chile…I would also love to get to more of Southeast Asia that I haven’t seen (I’m dying to see the Philippines and Vietnam) and northern Europe…I just want to go everywhere, honestly. What was your balance between researching different conspiracy theories and creating your own for this series? Along the same lines, were there any really strange Google searches you made while writing? In the books, the Circle of Twelve are kind of an amalgam of tons of “world-controlling secret society” conspiracy theories, without specifics from any one. They’re just kind of the general “a small group of people has a massive amount of power” theory. I did use a good deal of real history in the books, though, and kind of crafted my own conspiracy theories from it. Like, a lot of the history about Alexander the Great, the Diadochi, and Olympias is true, and I just made it more dramatic to craft this secret society around it. There were all kinds of weird Google searches for this book. Like, I’m probably on an FBI watch list somewhere. Everything from “blowing up XYZ Monument” to “how quickly would a person bleed to death from X injury” … yeah, sorry about that, law enforcement! I promise, I’m just a writer and not a serial killer. Now that the CoU trilogy is complete, what’s next? Can you share anything about a future book/series in the works? Sounds exciting—I can’t wait to hear more! Thanks again for stopping by today, Maggie! Maggie Hall indulges her obsession with distant lands and far-flung adventures as often as she can. She has played with baby tigers in Thailand, learned to make homemade pasta in Italy, and taken thousands of miles of trains through the vibrant countryside of India. In her past life, she was a bookstore events coordinator and marketing manager, and when she’s not on the other side of the world, she lives with her husband and their cats in Albuquerque, New Mexico, where she watches USC football and does work in graphic design. Thank you! I’m so glad she agreed to it 😀 Have you read her series? Great Q&A! Her answers are fascinating and she sounds a lot of fun.